Mandy thinks she finally has her life back on track. She loves working together with her parents at their veterinary practice and she has her beloved animal rescue center, Hope Meadows, a dream come true. She will have her own house soon and she's dating Jimmy, a gorgeous man. However, nothing is as easy as it initially seemed. Someone's trying to give Hope Meadows a bad name, she hardly has any time to see Jimmy and she's still waiting for approval to buy the house she wants. It's almost Christmas, will it be a good one for Mandy or does she have so many problems that she can't enjoy the holiday she loves so much? 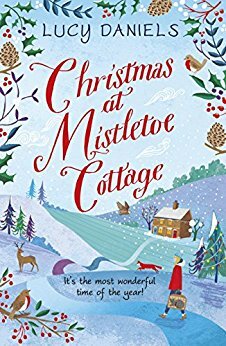 Christmas at Mistletoe Cottage is a wonderful heartwarming story. Mandy is a kindhearted woman. She's as good with animals as she is with people and her adventures put a big smile on my face. She always tries to help and she's being loved because of it. Someone's trying to ruin her plans for Hope Meadows, but Mandy's strong and spirited and she's determined not to let anyone come between her and the animals she loves so much. I liked her fierceness and hoped this person wouldn't ruin her business. I couldn't turn the pages quickly enough to find out if she'd be able to find a solution before everything gets completely out of hand. This kept me on the edge of my seat from beginning to end. Lucy Daniels's writing has an easy flow. The detailed and colorful descriptions of people, settings and animals are making Christmas at Mistletoe Cottage come to life in an incredible way. I especially loved how each animal has a specific personality, it's fun and it makes the story even more special. The animals that are staying at Hope Meadows are adorable and I really enjoyed reading about them. Christmas at Mistletoe Cottage is charming, entertaining and festive. It's a story filled with unexpected twists and turns and plenty of friendship, warmth and joy. If you love romantic stories about small towns, animals, family and friendship you'll definitely like Christmas at Mistletoe Cottage. It's the second book in the Hope Meadows series and I'd advise you to read Summer at Hope Meadows first if you want to fully understand Mandy's story. This sounds like a wonderful story. I will have to check it out. Thanks for the great review. Snow is finally starting to arrive here in Italy, so I can't wait to cozy up with tea and maybe this novel to read! Christmas themed novels are the best! This sounds like the perfect read for the holiday season! I love to read books like this around Christmas. I just love reading such stories this time of the year. I always wanted to be a vet - animals don't complain, unlike us humans! I'm worried about Mandy & Hope Meadows.